Assume the following values for the basic parameters of the circulation: f = 10 4/s, P = 2 x 10-11 /s/m, Lx = 2.5 x 107 m, Ly = 107 m, Ln = Lsy = 1.5 x 106 m, Aj = 1,000 m2/s, c = 0.16, g' = 0.01 m/s2, k = 10-5 m2/s and the typical values for these depth scales are: de ~ 313m, dw ~ 685m, and dK ~ 368m. Thus, under the current climate conditions, North Atlantic Deep Water is primarily controlled by wind stress over the ACC, the eddy term is very important, and diapycnal mixing plays a relatively minor role. In other words, to the lowest order, pycnocline depth and the meridional overturning rate are primarily controlled by the Ekman pumping rate. To the next order, eddy mixing tends to reduce the pycnocline depth and northern sinking rate, and this is consistent with the physical conception that baroclinic instability tends to flatten isopycnal surfaces and to reduce the northern sinking rate (i.e., it is a leakage in the circulation system). In addition, deep ocean upwelling enhances the pycnocline depth. However, the contribution of diapycnal mixing to the pycnocline depth and the meridional overturning rate is rather small, on the order of 16% only. Thus, under current climate conditions, diapycnal mixing in the deep ocean is not the most crucial controller for the meridional overturning cell associated with the NADW in the Atlantic Ocean (Toggweiler and Samuels, 1998). The dominant controller is wind stress associated with the southern Jet Stream, and it appears in the lowest-order term and the "first-order" correction term associated with X. Note that we have assumed a kind of eddy-mixing parameterization Aj ~ 1,000 m2/s in order to decide the depth scale of eddy mixing. The nondimensional parameter X is about 0.46; thus, it is not really a smaller parameter. As a result, treating the eddy term as a small contribution term may not be valid in general. In fact, eddy dynamics may play a critically important role in the Southern Ocean. Over the past couple of decades, the southern westerly has intensified (Yang et al., 2007); however, both in situ observations and numerical experiments based on a fine-resolution model have indicated that the zonal transport of the ACC remains roughly the same. This phenomenon is called eddy saturation (Marshall et al., 1993; Hallberg and Gnanadesikan, 2001). On the other hand, although results from numerical simulations with fine resolution indicate that strong wind stress can lead to stronger meridional circulation in the North Atlantic Ocean, there are no observations supporting this claim; thus, this remains controversial (Hallberg and Gnanadesikan, 2006). It is clear that the oceans behave in a much more complex manner than the simple scaling law discussed here would indicate. In the previous chapters, we discussed theories about wind-driven and thermohaline circulations, treating them separately. In reality, however, the oceanic general circulation is a combination of wind-driven circulation and thermohaline circulation. Conceptually, the ocean can be divided into three layers (Fig. 5.176). 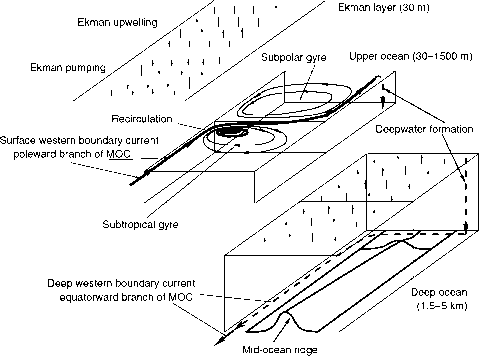 The top 30 m is the Ekman layer, where wind stress drives the horizontal Ekman transport, and its convergence and divergence give rise to Ekman pumping in the subtropical basin and Ekman upwelling in the subpolar basin. Within the depth range of 30-1,500 m the wind-driven subtropical, subpolar, and equatorial gyres are the dominating features. In addition to the linear Sverdrup gyre in the ocean interior, there is a strong recirculation in the northwestern corner of the subtropical gyre. Motions below 1,500 m are dominated by the thermohaline circulation, including the deepwater formation at high latitudes, equatorward deep western boundary currents, and the slow upwelling in the basin interior. Fig. 5.176 Sketch of the interaction between the wind-driven gyre and the thermohaline circulation in a Northern Hemisphere basin. Superimposed on the wind-driven circulation in the upper ocean, there is poleward mass flux induced by the thermohaline circulation, i.e., the upper branch of the meridional overturning cell (MOC), indicated by the arrow on the western side of the middle box in Figure 5.176. This branch of thermohaline circulation moves through the entire meridional length of the upper ocean dominated by the wind-driven gyre, and eventually leaves the upper ocean and sinks to the deep ocean through deepwater formation in the northeast corner of the basin. In the deep ocean, the circulation is primarily of the thermohaline type. The deep circulation can be traced back to the deepwater source in the northeast corner of the basin. In addition, the recirculation regime is the place of strong cooling and mode water formation. Thus, this is also a branch of the oceanic general circulation, which links the wind-driven circulation with the shallow part of the thermohaline circulation. A comprehensive picture of the oceanic general circulation should include this branch; however, for simplicity, this component of the circulation is not included in the sketch. Fig. 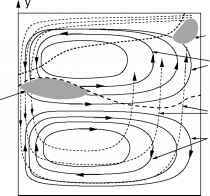 5.177 Schematic structure of a two-gyre circulation in a multi-layer model. x throughout the ocean. In particular, upwelling is stronger wherever mechanical-energy-sustaining diapycnal mixing is abundant, such as near the mid-ocean ridge. It is necessary to emphasize that the strongest upwelling system in the world's oceans is associated with the westerlies over the ACC; however, this is not included in the diagram. 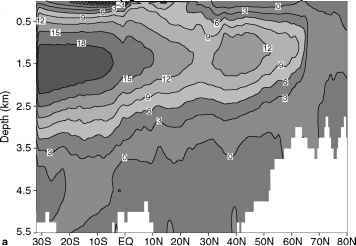 The most outstanding features in the framework of the oceanic general circulation are the western boundary current in the upper kilometer and its northeastward extension at mid/high latitudes. In addition, there is a strong deep western boundary current stemming from the deepwater formation site and the corresponding return flow in the upper ocean. The connection between the wind-driven gyres in the upper ocean and the thermohaline circulation in the deep ocean is further illustrated in Figure 5.177, where the horizontal view of circulation in a 42-layer model is shown. This model ocean includes a mixed layer of a uniform depth of 50 m (layer 1), and three moving layers below (layers 2, 3 and 4), plus a bottom layer (layer 5) which is very thick and motionless (Huang, 1989b). The model is forced by wind stress, and the temperature in the mixed layer is relaxed to a linear profile of reference temperature. 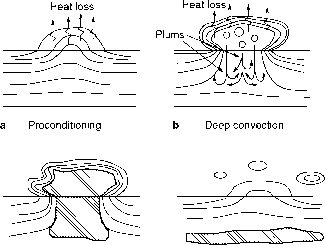 In Figure 5.177 the heavy dashed lines depict the outcrop lines (between layer 2 and layer 3 and between layer 3 and layer 4); lines with arrows depict streamlines of the wind-driven circulation in the upper ocean; and dashed lines with arrows depict the slow deep circulation driven by deep mixing and upwelling. Deep water formed at the northeastern corner flows westward and continues its movement as the deep western boundary current depicted by the dashed arrows in Figure 5.177. Deep water returns to the ocean interior and the upper ocean through upwelling driven by mechanical-energy-sustained mixing. Due to the basin-wide upwelling driven by the deep-water formation at the northeastern corner, there is cyclonic circulation in the deep ocean, depicted by the dashed arrows. Figure 5.177 represents a highly idealized circulation in a single-hemisphere basin. Many dynamical processes, such as the flow across the equator, flow over bottom topography, and flow induced by non-uniform mixing in the deep ocean, make the dynamical picture much more complicated. Thermohaline circulation, in particular the poleward heat and freshwater transports associated with the meridional overturning circulation, are key components in the climate system on Earth. The meridional overturning circulation rate in geopotential height coordinates has been widely used as an index for the strength of the thermohaline circulation. For example, the zonally integrated meridional streamfunction in the Atlantic Ocean diagnosed from the annual mean circulation, including temperature, salinity and velocity, for the year 2007 from the SODA (Carton and Giese, 2008) data are shown in Figure 5.178a. One of the most important features in this figure is the two-cell-structure of circulation. The clockwise meridional circulation in the upper part of the water column is clearly related to the NADW, and this includes the northward transport of warm water in the upper kilometer, the formation of NADW at high latitudes, and the return flow at mid depth (-3.5 km). This relatively shallow cell is the dominating part of the meridional circulation; there is a secondary meridional cell rotating in an anticlockwise direction. This cell is located below 3.5 km and represents the deep overturning related to the northward transport of AABW and its modification due to mixing between AABW and NADW. In many studies, the thermohaline circulation is characterized in terms of a meridional overturning circulation rate defined as the maximum of the meridional overturning stream-function, which can be identified from Figure 5.178. Since there are at least two overturning cells, a single index, such as the meridional overturning circulation rate, is not enough for the description of the circulation. Furthermore, thermohaline circulation is a complicated phenomenon in three-dimensional space. Poleward heat flux carried by the ocean is closely related to the meridional overturning circulation, horizontal gyration, and other aspects of the wind-driven and thermohaline circulation. Therefore, the traditional meridional overturning rate defined in the 0-z coordinates (0 is the latitude) may not be the best index for climate study. The role played by horizontal wind-driven gyres can be included through other diagnosis methods, as discussed in the second part of this section. In this section, we introduce other coordinates which can be used to map out thermohaline circulation, such as the potential density coordinates, potential temperature, and salinity. Using these coordinates, the meridional overturning circulation in the Atlantic Ocean, diagnosed from SODA (Carton and Giese, 2008), can be calculated; the corresponding streamfunction maps are shown in Figure 5.178. The corresponding maximal overturning rates in the northern North Atlantic Ocean (30° N and higher) in these four coordinates are 15.0 Sv (in 0-z coordinates); 23.1 Sv (in 0-a2 coordinates, where a2 is potential density, using 2,000 db as the reference pressure); 29.6 Sv (in 0-© coordinates, where © is potential temperature); and 18.9 Sv (in 0-S coordinates, where S is salinity).